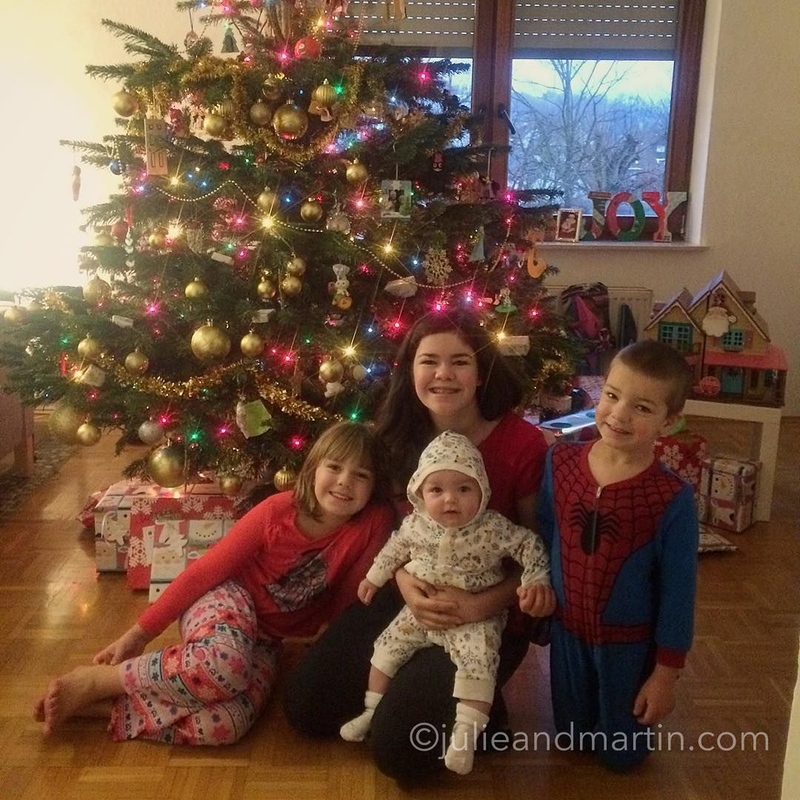 It was yet another Merry Christmas at our house this year. 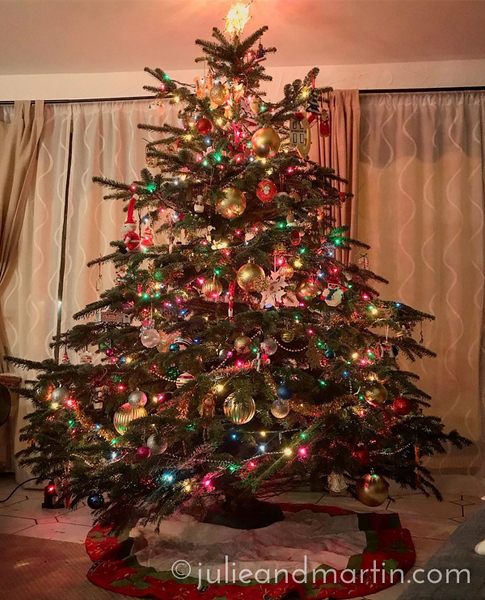 Last year, we were still living out of boxes and suitcases, and it was a minor miracle that we even got a tree and decorated. After a year of making this space our home, the holiday felt extra sweet. Our tradition continues! 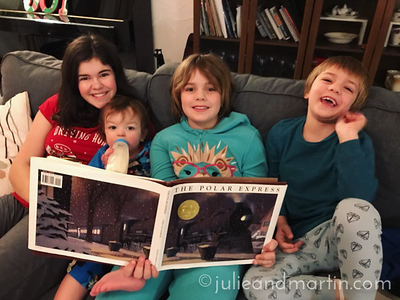 All four kiddos snuggled together for a Christmas Eve reading of The Polar Express. 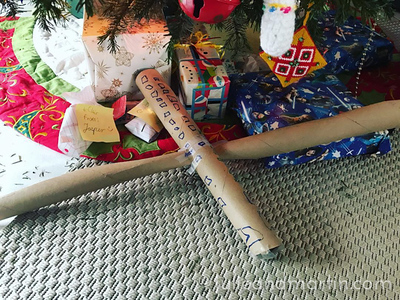 I went to water the Christmas tree and saw that my sweet boy put out the gifts he made for his siblings. This is the toy airplane he made for his baby brother, modelled after the airliners we flew last month. I am certain Santa will make sure it is front and center with a bow, and maybe even a cockpit and tail, on Christmas morning. I love that kid’s heart and creativity. I got my family. 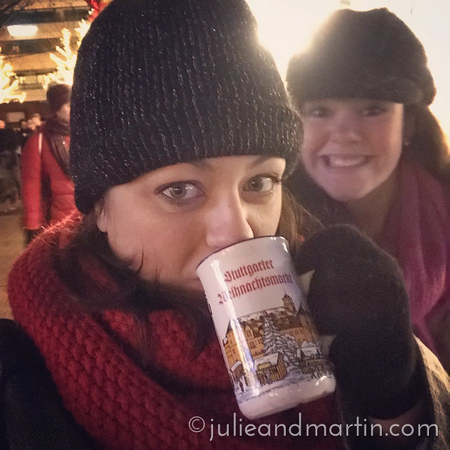 I got my glühwein. And I got money to spend at the Stuttgart Christmas market. 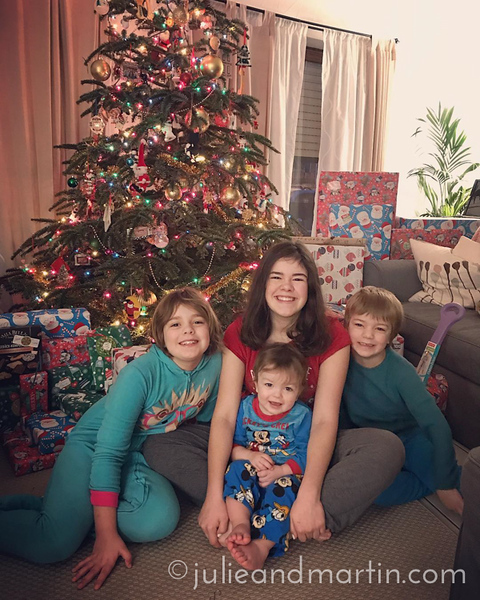 Merry Christmas!!!! 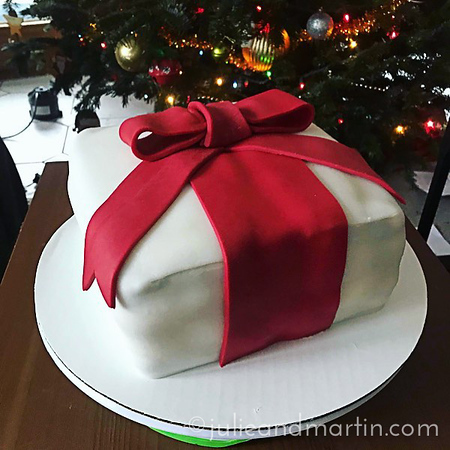 A friend needed a Christmas gift cake for a party. And gluten-free!! I tested out the recipe with the kids, and they ate it up. So here it is. Completely edible, too! It’s a gluten-free version of my chocolate cake and vanilla cream cheese frosting with vanilla and cherry fondant. According to my friend, this cake was a SUCCESS. 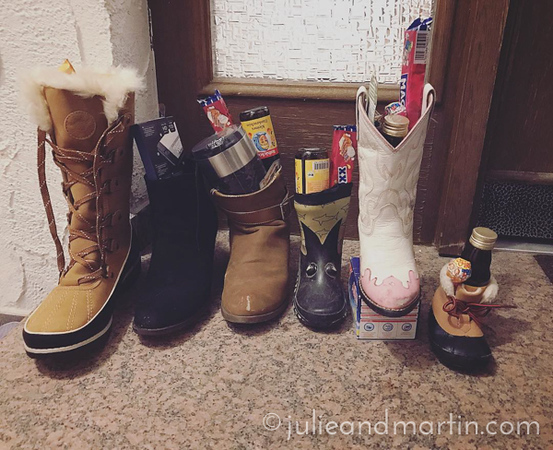 It appears Krampus skipped our house this year as nobody was whipped, terrorized, or taken away earlier this week when St. Nick passed through the neighborhood. We now have a Christmas tree full of memories and twinkling lights, thanks to my efforts today. 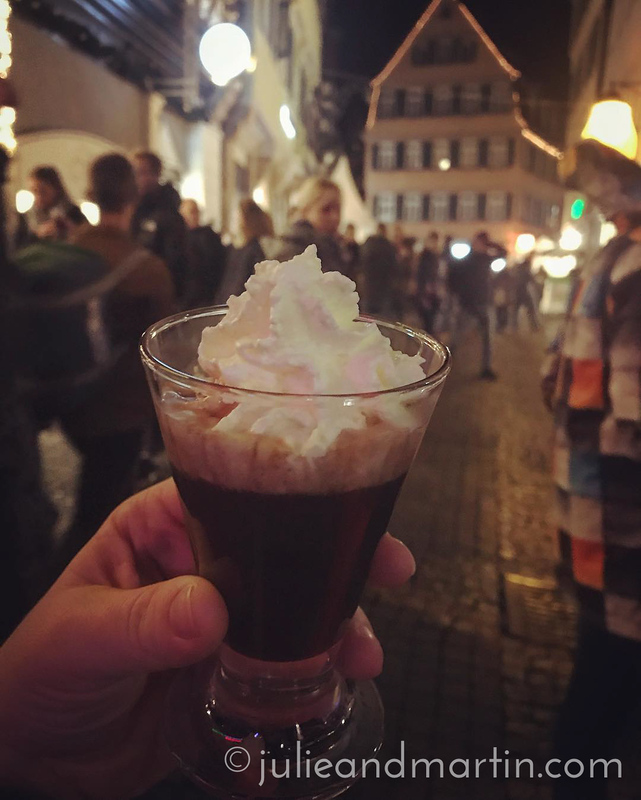 I had a choice today: a Reese’s Christmas tree peanut butter cup in the office … or this glass of steamy melted chocolate with almond liquor and whipped cream at the chocolate festival in Tübingen. I do believe I chose wisely. 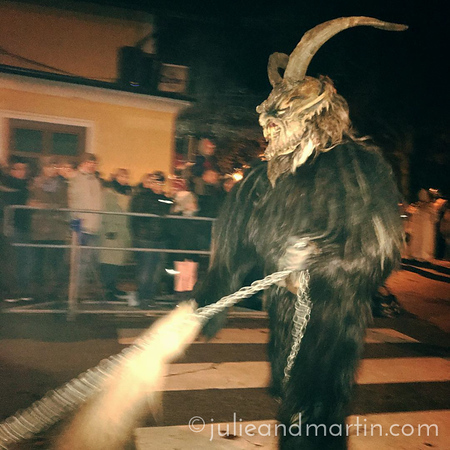 We kicked off the festive holiday season with whips, chains, and snarling beasts, as one does in Salzburg, Austria during the annual Krampus parade. Krampus is a crazed goat demon who travels with St. Nick. While the passive and polite saint hands out candy and gifts, Krampus sniffs out the bad children, the ones who misbehave, and whips, manhandles, and terrorizes them. Needless to say, a few made a beeline to yours truly. Grandpa sent over a bunch of trucks that light up and make noise. I think the one with the ladder is Jaz’s favorite. My dad had the same kind of toys as a kid, too, so he’s keeping alive the tradition of a loud Christmas morning!